Just three days after a second place finish in their home invitational, men’s golf headed to Oakbrook, IL, to play in the Elmhurst Invitational on Thursday, Sept. 27. The Duhawks were able to overcome the short week of rest and pull out a first-place victory. Among the 12 teams competing, Loras College finished tied with Lake Forest at the end of match play, with both teams shooting 13-over par. It wasn’t until five tiebreakers later that Loras was finally crowned the team champion of the 2018 Elmhurst Invitational. Among other finishers, host Elmhurst College finished just one stroke off of the lead placing third, Augustana College finished in fifth with a team total of 23-over par, and Judson University placed last with a combined 45-over par. The men’s golf team poses for a picture while holding their first-place trophy. Along with a stellar team performance, many Duhawks contributed with spectacular individual play. Leading the way was sophomore Jake Peiser, who finished tied sixth overall, shooting a 2-over par. Peiser’s score of 2-over 74 was a new season-low for the Duhawks. Junior Peter Hutton and first-year Ryan Keating both finished tied 15th shooting 4-over par. Hutton’s 4-over 76 was his best round of the season, while Keating tied his season low. Jake Grabner also had a strong showing, shooting an impressive 3-over 75 and finishing tied for 10th. Ricky Schmidt of Lake Forest College took home the individual crown, shooting a 4-under 68. He was in complete control throughout the day and there was no doubt that he was going to be named champion. 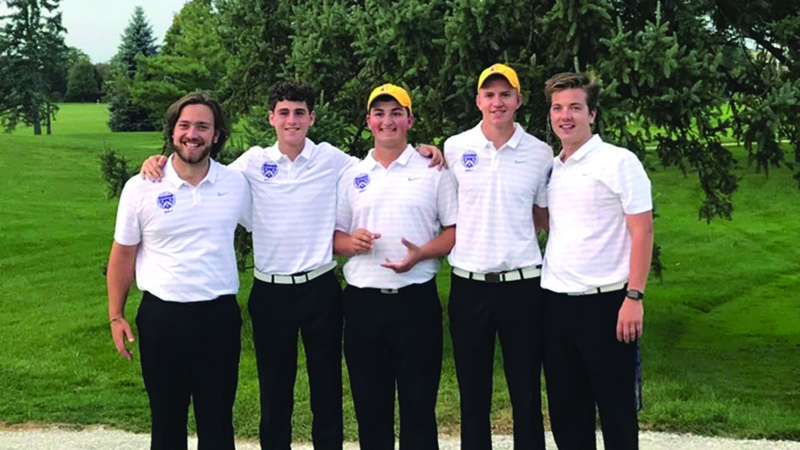 Overall, top-tier individual play was the key to Loras claiming the team title. Men’s golf will look to continue their success on the links as they wrap up their fall season at the Clarke Invitational on Wednesday, Oct. 5. This is a rescheduled match from Wednesday, Sept. 5, which was postponed due to inclement weather.